The Intel International Science and Engineering Fair, a program of Society for Science & the Public, is the world's largest international pre-college science competition. The top three Grand Award Winners on stage at Intel ISEF 2018. PHOTO COURTESY OF SOCIETY FOR SCIENCE & THE PUBLIC/Chris Ayers. The Intel International Science and Engineering Fair (Intel ISEF) unites the top young scientific minds, showcasing their talents on an international stage, where doctoral-level scientists review and judge their work. Each year, approximately 1,800 high school students from more than 75 countries, regions, and territories are awarded the opportunity to showcase their independent research and compete for on average $5 million in prizes at Intel ISEF. The competition focuses on identifying, inspiring, and engaging the world's next STEM generation. Millions of students in grades 9-12 or equivalent worldwide compete each year in local and school-sponsored science fairs. 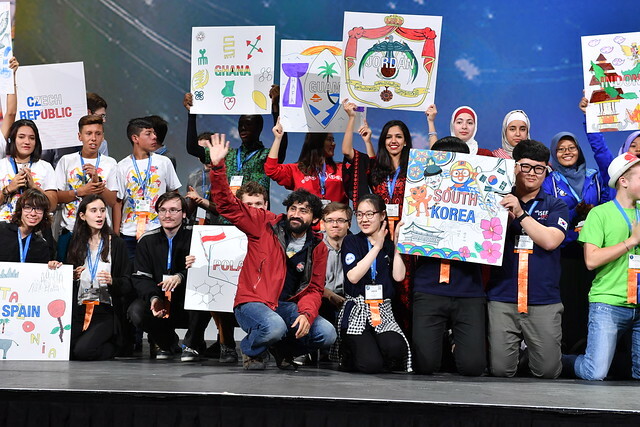 The winners of these events go on to participate in 420 Society-affiliated regional and state fairs, from which the best win the opportunity to attend Intel ISEF. Each affiliated fair may send a pre-determined number of projects to Intel ISEF (as factored by participation and high school population) to compete in 22 different categories. Intel ISEF alumni have gone on to receive some of the world's most esteemed academic honors, including one Nobel Prize, one Breakthrough Prize, three National Medals of Science, and six MacArthur Foundation Fellowships. They're involved in some of the most groundbreaking scientific research. More than $5 million in awards are given annually at Intel ISEF. The top winner of Intel ISEF receives the Gordon Moore Award, and $75,000, with the next top two winners each receiving a $50,000 award. More than 600 individual and team awards are presented every year at Intel ISEF. Each entry is judged at least four times with category awards given in first, second, third, and fourth place. Awards are $3,000, $1,500, $1,000, and $500 respectively in each of the 22 categories. Awards worth approximately $4 million are provided through the Intel ISEF Special Awards program, and include tuition scholarships, summer internships, scientific field trips, and laboratory equipment. They are provided by Intel and over 50 other corporate, professional, and government sponsors annually. Alumni of the International Science and Engineering Fair continuously express how influential the competition was to their lives. "My first time going to Intel ISEF, it was really astounding to meet other finalists from around the world. On the first night there’s the pin exchange, and talking to people from many countries about their research was quite awesome. My favorite was the Alumni Entrepreneur Panel, which showed where ISEF alumni had gone on from their research," says Jeremiah Pate (Intel ISEF 2013-2017). Jeremiah recently visited Stockholm and the Stockholm International Youth Science Seminar after receiving the Dudley R. Herschbach Stockholm International Youth Science Seminar Award. "Judge after judge engaged me as a scholar, learning about my work and simultaneously welcoming me into the mathematics community. I signed up to be an Intel ISEF judge as soon as I became eligible so that I could give that same gift to the next generation of scholars," says Scott Kominers (Intel ISEF 2005, Intel STS 2005). Scott, a faculty affiliate of Harvard University's Department of Economics and Center of Mathematical Sciences and Applications, now comes back to judge at Intel ISEF. "Intel ISEF showed me the power that STEM has to change the world, and this has led me to promote STEM in my community, both among my peers and in my school," says Rahul Subramaniam (Intel ISEF 2017). Rahul recently traveled to India after receiving the Intel-Indo U.S. Science and Technology Forum Scientific and Cultural Visit to India Award. Science fairs give people a way to get fascinated by science at an early age. If I hadn’t done science fairs, I probably wouldn’t be doing what I’m doing today. The Society for Science & the Public is thrilled to be a part of the film Inventing Tomorrow – a documentary following students from Mexico, India, Indonesia and Hawaii as they prepared for Intel ISEF 2016. The film competed and premiered at the 2018 Sundance Film Festival. The Society partners with Intel — along with dozens of other corporate, academic, government and science-focused sponsors — who provide the support and awards for Intel ISEF. The fair began in 1950 as the National Science Fair in Philadelphia and transitioned into an international competition in 1958 with the addition of Canadian, German, and Japanese finalists. Intel became the fair's title sponsor in 1997, and, today, the number of countries participating has reached 80. Each year, Intel ISEF is hosted in a different city, circulating between Los Angeles, Pittsburgh, and Phoenix. The Local Arrangements Committees from each city partner with the Society and Intel to provide support for the event, including the recruitment of thousands of volunteers and judges and organizing an Education Outreach Day where over 3,000 middle and high school students visit the finalists and learn more about their projects. Thousands of volunteers are needed to run Intel ISEF, and there are various volunteer opportunities. For more information, email isefvolunteer@societyforscience.org. Volunteers serve as general volunteers, interpreters, and judges. All judges have a Ph.D. or equivalent degree and/or six years of relevant experience. Learn more about becoming a judge. Learn more about the competition week and how life-changing Intel ISEF is for our alumni.